The return on investment (ROI) of automating your expense management should be one of the main internal selling points of the project. Fully automating your expense management will greatly decrease costs by reducing the time your employees spend dealing with expenses, by increasing compliance with your organization’s travel policy, by reducing expense fraud and errors in expense reports, by simplifying reporting and by increasing visibility into spending patterns. Few projects are so easy to implement and have such a high return on investment . This report outlines how investing in a dedicated expense management tool will pay for itself and can yield an ROI of up to 500%. 1.Lost employee productivity for traveling employees, approvers and the finance/accounting department. 2. Reduced prevalence of duplicate entries and errors in expense reports. 3. Happier and hence more productive employees because of faster reimbursement and friction-less travel. 4. Increased compliance with corporate T&E policy. 5. Insights from data that will allow you to make further cost savings. Managing expenses properly and keeping them under control is an important part of any business. Aberdeen (2016) estimates that travel and expenses (T&E) is the largest expense item for companies after employees’ salaries and wages. Yet, many companies do not optimize the way they deal with processing and controlling expenses, leaving a lot of money on the table. Are you looking to reduce the costs of your business and increase profits? Then reviewing how your company manages expenses and optimizing this process could have a significant impact on your organization’s bottom line. Fully automating your expense management will save your employees a great amount of time filling out expense reports, will increase compliance with travel policy, reduce expense fraud and errors in expense reports, simplify reporting and increase visibility into spending patterns, all resulting in a huge decrease in costs. Few projects have such a high return on investment (ROI). This report outlines how investing in a dedicated T&E management tool such as Rydoo will pay for itself and could yield a return on investment of up to 500 percent. Many organizations see travel expenses as an investment in their business, with its success often measured in terms of new business, stronger client and supplier relationships, and professional development of their staff. It’s an investment that pays off: Oxford Economics (2013) estimates that for every dollar invested in business travel, firms generate $9.50 in revenue and $2.90 in profit. With businesses spending between 6 and 12 percent of their annual budget on T&E, this is an important operational cost. Yet, while most businesses spend ample resources on optimizing and streamlining most of their operations and processes to minimize costs and maximize revenue, travel expenses are often forgotten. According to PayStream Advisors (2017), 37 percent of companies still manage expenses manually, with employees (e-)mailing receipts to the finance or accounting department and typing over the relevant information into spreadsheets. Of the 63 percent of the companies who do use a dedicated expense software tool, Forrester Research (2014) estimates that more than half still make their employees enter some expenses manually, as the expense software only partially automates the reporting of expenses. 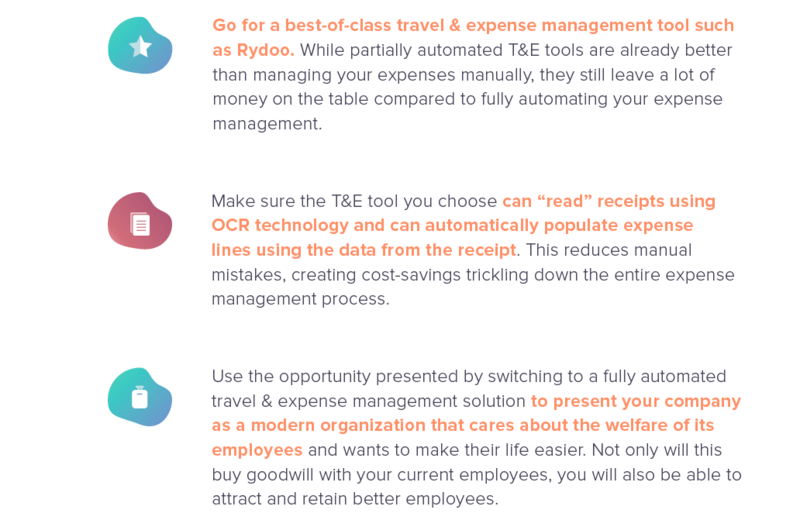 Only 18 percent of companies use a TEM (travel expense management) tool such as Rydoo that completely automates the entire expense process. It is therefore not surprising that T&E costs are considered the second most difficult operational expense item to control (Forrester Research, 2014). Not only is manual expense management a waste of resources, a source of errors, employee dissatisfaction and even fraud, companies that are not effective at controlling costs are also less profitable and experience less revenue growth (Oxford Economics, 2017). Finance leaders at well-performing companies understand the link between superior financial performance and cost control, and acknowledge that T&E software tools that automate expense reporting are a crucial tool for modern and efficient expense management. This implies that there is great room for improvement in many companies when it comes to expense management. Companies implementing an expense management tool that completely automates the entire expense management process typically report very high returns on investment. This because the potential cost-savings are huge, while the price for dedicated T&E software tools is very reasonable. Some companies report ROIs of up to 500 percent, while the average payback rate for the most popular expense management tools is 6 to 17 months. On top of that, expense automation also increases compliance with company travel policies and employee happiness. So, what are the ROI drivers of automating your expense management? To analyze the return on investment of automating your expense management, we have to look at the benefits and costs of automation. Figure 2 provides a schematic overview of all costs and benefits. The cost-side is actually very straight-forward and only consists of two factors: the price of buying an expense management tool and the cost of deploying it. The benefit side of the equation is slightly more complicated, with six potential sources of benefits: lost employee productivity, reduced prevalence of duplicate entries and errors in expense reports, decreased expense fraud, increased compliance with company travel policy, insights from data that will allow you to make further cost savings and happier employees. Let’s zoom in on each of these factors. Processing expenses manually is a time-consuming endeavor. In a company where expenses are still managed manually, traveling employees must collect receipts when incurring expenses, write down any non-receipt items, enter the date, vendor, item category, price and currency of each expense item into a spreadsheet or “the system”, compile an expense report and print it, tape or staple the receipts to the report, sign and date the report and mail it to the right person for approval. Once approvers receive a paper expense report, they must check each expense item has a receipt with info that corresponds to the expense report. Approvers must also check compliance with company travel policy and double check duplicate entries, errors or other abnormalities. Once the report has been approved, it moves onto the accounting or finance department, where often the expense report and receipts will be checked again, after which each expense has to be inputted into the company’s accounting software or the company’s payroll system for reimbursement. It is not uncommon for accounting staff to spend hours inputting expenses, correcting errors and chasing lost receipts. Counting together all man-hours lost by traveling employees filling out expense reports and approvers and accounting or finance staff processing expense reports results in a massive loss of productivity. This loss of productivity can easily be alleviated by using a tool that fully automates the entire expense management process: employees then snap a picture of the receipt on the go, the software automatically fills in the expense report based on the data “read” from the picture and checks compliance with company travel policy, managers only need to approve the expense if the system finds any abnormalities, and all the data gets automatically inputted into the accounting and reimbursement software. 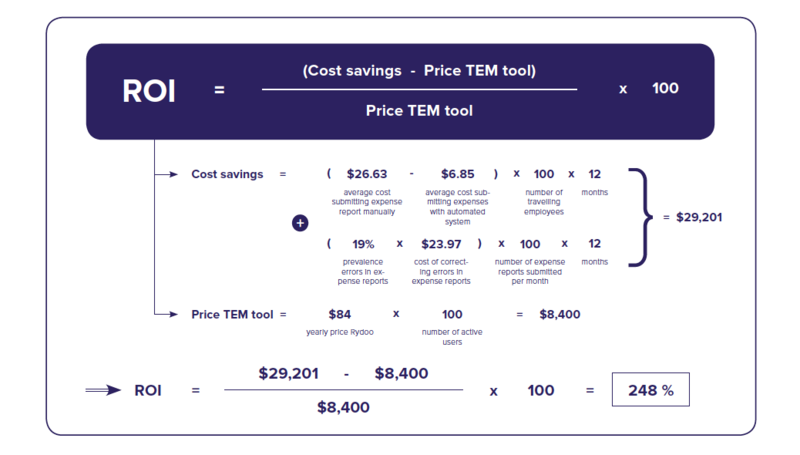 According to PayStream Advisors (2017), the total average cost of submitting an expense report manually is $26.63, while a fully automated T&E management tool such as Rydoo cuts this cost down to a mere $6.85. That is a saving of almost $20 per expense report per employee. These savings add up over time. Let’s consider a small company Global Matics Inc. with 300 employees. Of these 300 employees, 100 travel once per month for business. A simple calculation reveals that Global Matics Inc. could, therefore, save a staggering $23,736 per year by automating their expense management (see equation for details on the calculation). Given that Rydoo charges as little as $84 per active user per year, switching from manual expense management to Rydoo could yield Global Matics Inc. a return on investment of 183 percent. The return on investment of companies that already have some degree of automation of their expense management is slightly lower, yet there are still considerable cost-savings to be made. According to PayStream (2017), the average total cost of processing expense reports with some automation is $17.31. This means that switching to a fully automatic TEM solution will save you a little bit over $10 per expense report, a considerable saving. Now, let’s imagine that our example company Global Matics Inc. was already using a very simple expense management tool, then switching from this tool to complete automation with Rydoo would yield Global Matics Inc. a return on investment of 49 percent. These averages, however, conceal a great amount of 3 variation. Companies that have more senior staff traveling than average, for example, will be able to obtain a higher ROI as the hourly wages of senior staff are higher and hence the potential cost-savings are higher. This is also the case for companies that employ more highly educated people than average or companies in industries or regions where wages are higher. Employees are only human, and so it shouldn’t come as a surprise that expense reports are full of mistakes. Duplicate entries, expense lines that do not correspond to the info on the attached receipts, empty fields, missing or ripped receipts, etcetera. A study from the Global Business Travel Association (GBTA Foundation, 2015) estimates that up to 19 percent of all expense reports contain mistakes. These mistakes are costly, considering that accounting or finance departments have to correct the mistake or send the expense report back to the employee, wait for the employee to resubmit a corrected version and then review the report again and input the data into the accounting and reimbursement systems. 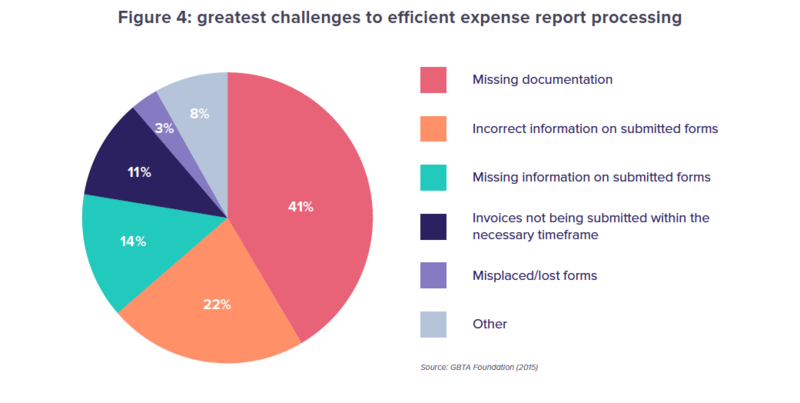 If the average time to complete an expense report is 20 minutes, then correcting an expense report with a mistake takes on average 18 minutes, almost doubling the amount of working time required by your employees that could be spent on more productive tasks (GBTA Foundation, 2015). Automating your expense management will greatly reduce the number of errors in expense reports. Innovative expense management tools such as Rydoo let you take a picture of the receipt when incurring an expense and “read” the information on the picture using OCR technology. This means that employees can no longer lose their receipts or fill in incorrect information as the system does this for them. Duplicates entries are also a thing of the past, as the software will automatically detect these. These extra benefits will increase the ROI of automating your expense management even more. In the case of our example company Global Matics Inc., taking into consideration errors in expense reporting would increase the return on investment of automating their expense management with Rydoo with 65 percentage points to 248 percent. According to a global fraud survey of the Association of Certified Fraud Examiners’ (ACFE, 2014), the average business loses 5 percent of its revenue to fraud each year. The median loss due to expense reimbursement fraud is $30,000 and businesses in manufacturing, education, construction, technology and service are particularly vulnerable. Expense fraud is not only a significant source of leakage of company revenue, it also opens up your company to possible legal and tax problems. There are many ways a crafty employee can inflate their expense reports and extract more money from their employer. Purchases can be mischaracterized, like the books an employee bought as Christmas gifts for his/her kids can become $50 worth of “learning material - conference” expenses. Transaction amounts can be padded, a group of employees can submit the same business lunch receipt using different expense reports, or a canceled business flight gets reimbursed to a personal credit card. ACFE (2014) states that 50 percent of the fraud committed can be caught by implementing internal controls and checks. In some companies, random and regular checks are put in place to detect expense fraud, yet human control is insufficient, as it takes the median business up to 24 months to detect expense fraud (ACFE, 2014). It’s easy to miss fraudulent activities if you’re not looking carefully, especially if accounting or finance departments have to rely on a manual process that leaves them overworked. Implementing an automated expense management system will detect fraud more easily, improving your companies’ financial health and freeing up the time of your accounting or finance team to perform better. A good expense management solution will help you detect fraud in multiple ways. TEM tools can automatically merge credit card statements with receipts, making it easy to check whether expenses match credit card spending. They also simplify the approval process, making it easier to apply more elaborate approval rules when employees spend more than usual or more than they should. Moreover, by making it so easy for your employees to report expenses, missing or unreadable receipts can no longer be used as an excuse. Finally, expense management tools make it easy to analyze your expense data and identify abnormalities or employees that spend too much. Companies that are effective at controlling costs understand that a good travel policy is necessary to keep T&E costs under control. A good travel policy, though, is only effective when employees actually comply with the rules. Most well-performing companies have travel policy compliance rates above 70%, with top-performing companies scoring policy compliance rates of more than 91 percent (Aberdeen, 2014). If compliance rates with your company’s travel policies are low, that’s a sign that your T&E costs may be unnecessarily high. Research from LSE Consulting (2017) has shown that companies with travel policy compliance rates of 80 percent or more have a 23 percent lower total indirect costs per traveler than companies with low compliance rates. Ensuring that your companies’ travel policy is accurately applied and enforced, however, can be a nightmare when managing expenses manually. 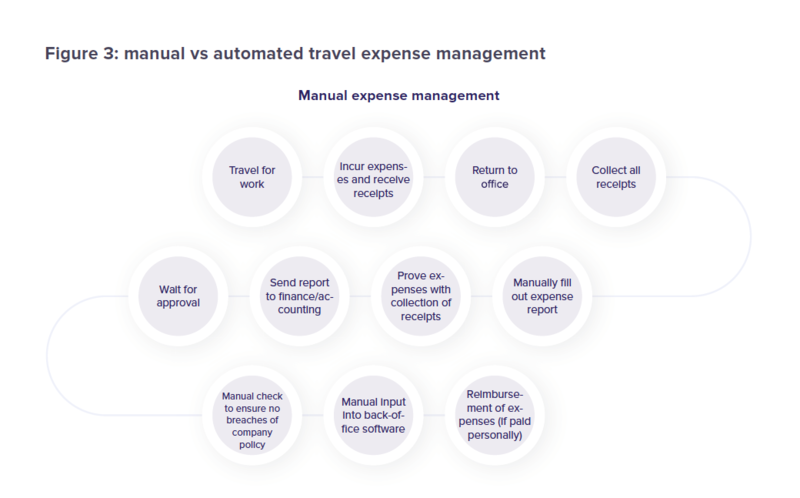 An automated expense management tool is tailored to your company’s travel policy and has built-in controls, which will flag or reject non-compliant expenses. For organizations that have different tiers of allowable expenses or different policies across countries, best-of-breed expense solutions, such as Rydoo, allow unlimited configuration of business rules, enabling expense policies to be configured to your organization’s needs. Your users will immediately see the expenses that are out-of-policy and can add an explanation or remove them altogether from their expenses list. Using an automated T&E management tool effectively increases the average rate of T&E compliance by 26 percentage points (Aberdeen Group 2016a), while reducing confusion and conflict about why a particular expense item has been declined. Moreover, your expense management tool will make it easy to identify patterns in non-compliant reports, so you can easily improve your travel policy or the way you communicate your travel policy with your employees. Unlocking useful insights from your T&E data is crucial in achieving cost control and compliance for many companies. Expense management solutions will alleviate having to download, import and merge data from multiple sources, saving you loads of time, while providing you with compelling and actionable information in real time. Good expense management solutions provide you with near-real-time data presented in clear visual dashboards. This increased visibility in your company’s T&E spending, in turn, will help you eliminate wasteful expenditures, optimize travel expenses, support better T&E planning, budgeting and forecasting, identify inefficient purchasing strategies and contracts, and identify frugal and problem users to ensure that approvers and auditors are focusing their attention on the right individuals or departments. For example, data showing how much a business spends on accommodation or flights can be used to negotiate lower corporate rates with hotel chains or airlines. If flight purchase data shows that one department consistently purchases tickets last-minute, action can be taken by department heads to prevent this from happening in future. Or, a competition could incentivize employees to be more frugal, as it would be easy to identify these employees. 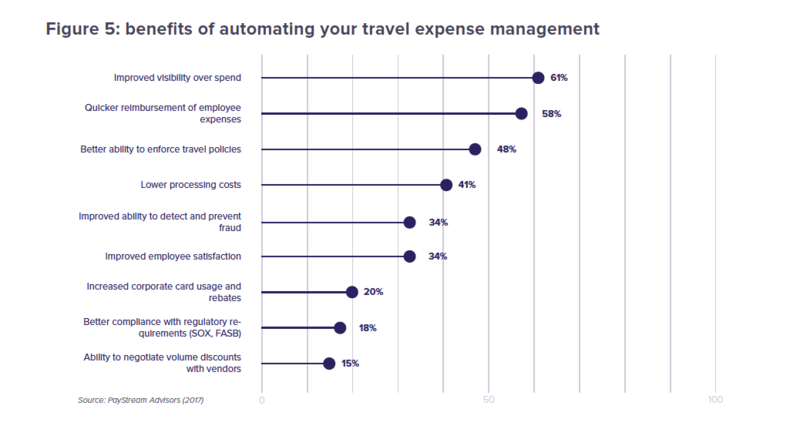 While increasing compliance and optimizing cost-savings are often the main drivers for companies to start looking for a TEM solution (Oxford Economics, 2017), increased visibility into spending is an often-overlooked benefit of automating travel expense management. 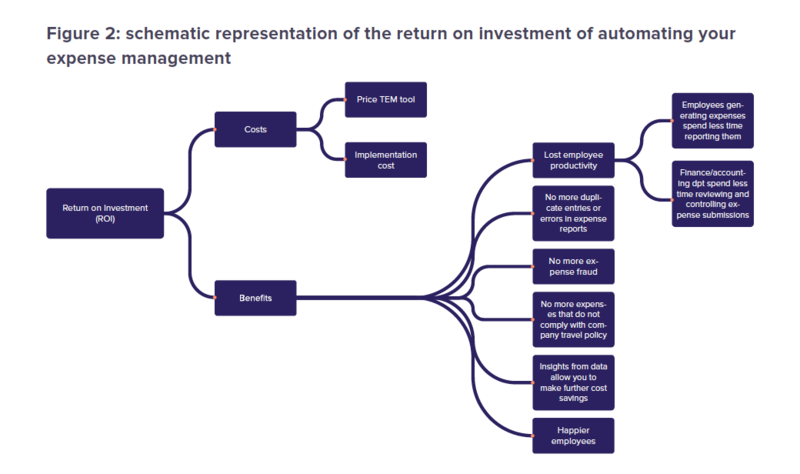 Yet, companies identify improved visibility over spend as one of the main benefits of automating their T&E management (see figure 5). Companies often do not realize the benefits of visibility into T&E spending before it occurs. However, analyzing your T&E data can unlock incredible insights that can improve your company’s bottom line. Finally, by automating your expense management, you will make your employees happier. Employees regard writing expense reports as a tedious task wasting their valuable time. Especially senior-level business travelers complain often about the burden of administrative tasks. Automating your expense management will alleviate this problem. Moreover, employees like to be reimbursed quickly when paying for travel expenses out of pocket. Tardy reimbursement can cause financial hardships for certain employees and will bring employee morale and productivity down. Automating your expense management will bring the average reimbursement period down from 9.3 days to 3.5 days (Aberdeen, 2013). Happier employees also mean more productive employees. According to a study by professor Daniel Sgroi (2015), happy employees are up to 20 percent more productive than unhappy employees. When it comes to salespeople, happiness has an even greater impact, raising sales by 37 percent. Moreover, replacing an employee is a costly endeavor, with estimates ranging from 16 percent of the annual salary for an hourly employee up to 213 percent of the annual salary for an executive (CAP, 2012). These benefits will have many long-lasting effects for your company, and the benefits will reinforce each other, providing you with an even higher return on investment than expected. Happier employees will be more productive, and these productive employees will no longer need to use their valuable time to fill in tedious expense reports. This will have a direct and prolonged effect on your company’s business success. Improved visibility into your company’s spending and lower costs due to decreased expense fraud and increased compliance with company travel policy will improve your company’s financial health and free up resources for investments, which in turn will ensure your organizations’ competitive advantage and future profits. Moreover, switching to a fully automated expense management solution is an opportunity for your company to present itself as a modern organization that cares about the welfare of its employees and wants to make their life easier. You will be able to attract and retain better employees as they no longer have to perform routine tasks. This is especially true for employees in your finance department which gets the lion’s share of the burden of processing manual expense reports and would prefer to stop chasing travelers for missing receipts or deciphering unreadable receipts. The exact return on investment your company will obtain, will depend on many factors, including the number of employees that travel in your company, what systems are currently in place to keep track of expenses, the price and implementation cost of the T&E management solution you choose etcetera. One thing is sure, however. Compared to manual expense management or partially automated expense management, deploying a best-of-class expense management tool, such as Rydoo, will save you a tremendous amount of money, lost man-hours and employee frustration. 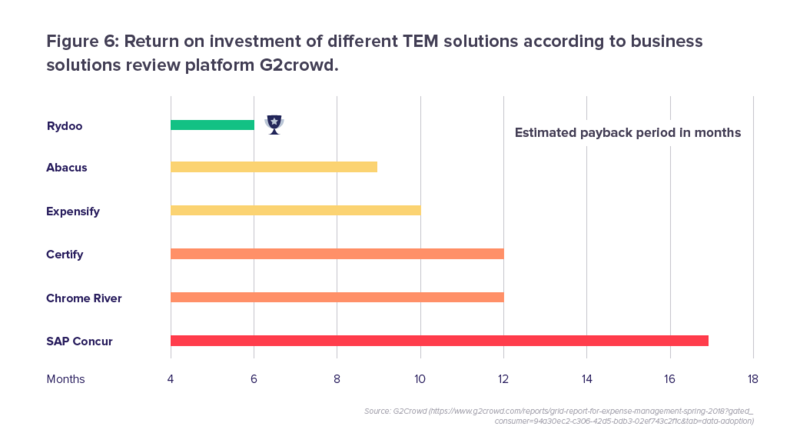 On average, companies need 6 to 17 months to break-even in time when using the most popular T&E management solutions (see figure 6) and with Rydoo, returns on investment of up to 500 percent percent are not uncommon.